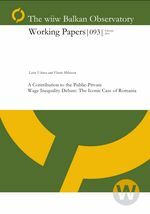 This paper studies the public-private wage inequality in Romania. Although public sector employment is perceived as safer and offers more benefits, we find that in Romania it also offers higher wages, after controlling for experience, education, and gender. Decomposing the public-private wage premium into the effect of personal characteristics, coefficients, and residuals, we show that only about half of this premium can be attributed to personal characteristics. The premium is increasing across the wage distribution, leading to more inequality in the public sector. We also find the effects of self-selection are negligible, the premium being still positive and significant after controlling for this.